Woke to clear skies and sunshine, after it rose! Unfortunately, the weather didn’t stay this way and by lunch time it was even colder, raining and very bleak. It only took as an hour and a half to drive to Clare, good driving all the way. The caravan park at Clare is very nice although we aren’t too keen on being put on a site between two large gum trees. The park was nearly empty when we arrived before lunch, however, it very quickly started to fill with caravans and tents. Not only is it a long weekend, but I think it must also be a student-free day for schools. This afternoon we drove out to Mintaro, a village which dates back to the 1840’s and obviously very proudly looked after by the locals. Of course, most of the old buildings have been turned into bed and breakfast establishments, but great care has been taken to retain the heritage quality of the village. This is also the place that C. J. Dennis (A Sentimental Bloke) lived as a child. Not far from Mintaro we discovered Martindale Hall, a large Georgian mansion which originally was built on an 11,000 acre merino farm and the grounds included a polo field (of course! ), a cricket oval and a race course. 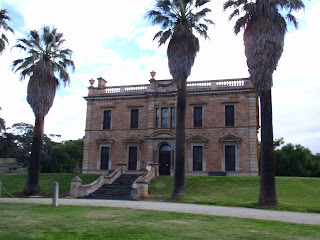 Martindale Hall was also the setting for the school in the film, Picnic at Hanging Rock. (Hanging Rock is actually in Victoria.) We wandered around inside – some beautiful rooms and furniture, even saw the master bedroom which was used as Miranda’s bedroom in the film. The bath was so deep that if it was filled with water, the water would have come up to my hips! Not to mention the difficulty getting in and out, with the large timber surround. The caravan park is obviously in a bad location for television reception and we were told we would need a coaxial cable, available for hire, of course. We have brought our own but had to get another adaptor to make it fit the plug here and then discovered it wouldn’t fit into the caravan fitting (supposed to be universal fittings!). So to solve the problem, the coaxial cable goes over the roof, in through the bedroom vent and straight into the television. Bit messy, but works well.